The Ultimate Amazon Seller Course is a proven and honest Amazon FBA course, unlike the Webstone University course. See details below! The Webstone University by Weston and Brandon is a SCAM! 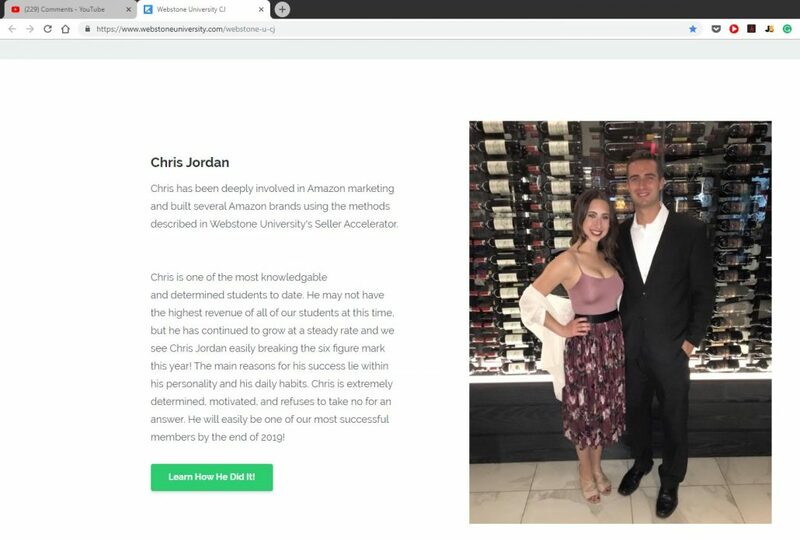 The sales page for the Webstone University features a student case story of a guy named Chris Jordan. However, Chris Jordan SPAMs YouTube comments of successful Amazon FBA experts in an attempt to drive traffic to the Webstone University website. He is actually in business with the “creators” Weston and Brandon. He has a vested interest in the business and this fact is not revealed on the Webstone University sales page. This is very unethical and dishonest. Putting a case study and testimonial from a supposed student on their sales page to create fake “social proof” is very underhanded when the supposed student is actually a partner in their course business! This is the case with Chris Jordan. Want proof? This is Chris Jordan who is featured as one of their star students on the sales page for the Webstone University. This is a screen shot of the community comments section of one of my YouTube videos. Chris Jordan is spamming comments on YouTube videos trying to generate traffic to the Webstone University course! He purports to want me to review the course to see if people "think its worth it". Note that the link he gives includes an affiliate URL (webstone-u-cj) which identifies the traffic as coming from this URL that he spams YouTube comments with! If Chris Jordan is already a successful student on the Webstone University course, why would he feel the need to go about spamming YouTube comments of established experts in Amazon FBA? How can you trust ANYTHING from these guys when they engage in deceptive practices such as these? BUYER BEWARE! Another sketchy issue with these guys is that Weston and Brandon never give their last names. These two jokers certainly do not give you much confidence in their course when they hide their last names, employ fake student testimonials (Chris Jordan), and appear in their pajamas on the course sales page! If you are looking to invest in a HONEST Amazon FBA course, then I suggest that you take a look at The Ultimate Amazon Seller Course. This is a proven and legitimate course as opposed the Webstone University course. You will not regret it! I feel as though I don’t get any support from the him or the so called “Coaches”. When you ask a question, your lucky to get a response or they tell you to reach out to the FB Group. I love the way you teach new techniques of searching for products. The support you give to the members ( I know and talk to one of them ) and make them successful is Amazing, I believe the saying, “If I help you become Successful, I become Successful.